"I spoke several weeks ago with my friend and vocalist Keith St John, to once again thank him for lending his talents to Quiet Riot during our time of need. 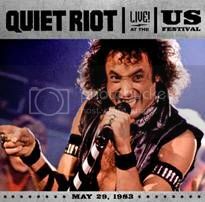 Keith stepped in on very short notice so that Quiet Riot could meet our live dates in February. Keith knocked it out of the park with great vocals and performances and we are forever in his debt. 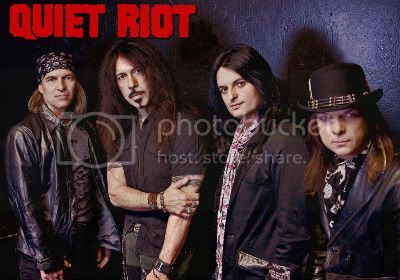 "Quiet Riot takes this opportunity to introduce our new vocalist Scott Vokoun and we look forward to seeing all of you on tour!" Following a pair of DVD releases, Shout! 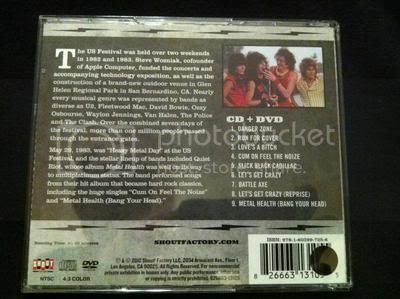 Factory has announced the release of several performances on CD from the famous US Festival in California including Quiet Riot. Spearheaded by Apple Computer co-founder Steve Wozniak, the US Festival intended to be a celebration of technology and culture, with a temporary stage and open-air venue paid for by Wozniak himself just for the purposes of the festival. The event featured Heavy Metal Day on on May 29, 1983 with the aforementioned Quiet Rio along with the following stellar line-up: MÖTLEY CRÜE, OZZY OSBOURNE, JUDAS PRIEST, TRIUMPH, SCORPIONS and VAN HALEN. Despite the historical value of the performances, the festival was a failure, with two reported deaths at the 1983 festival and Wozniak and promoters losing some $24 million US. Setbacks aside, the performances remain a worthy footnote in rock history, and Shout! Factory aims to memorialize these moments, first through DVD and now on CD. 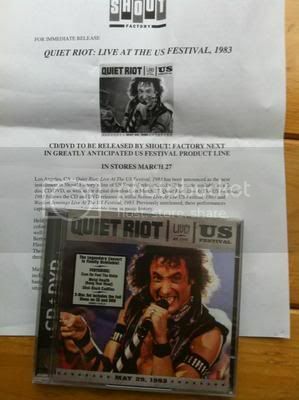 On March 27th, the CD/DVD combo of Quiet Riot's set will be released, fresh off the success of their US #1 album, Metal Health.